To delete apps you have downloaded, follow the steps below. • Recommended Apps cannot be deleted. • Most apps located under My Apps can be deleted. 1. Press the Smart Hub button on the remote. 2. Use the navigation pad to select the Samsung Apps Panel. 3. Using the navigation pad on your remote to highlight the app you want to delete. 4. Press and hold the Center of the navigation pad until the app details menu appears. 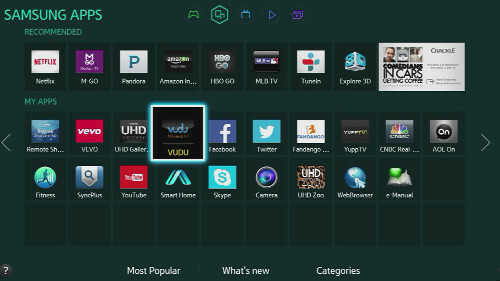 NOTE: If you do not have the delete option the app came preinstalled on the TV and cannot be deleted. 5. 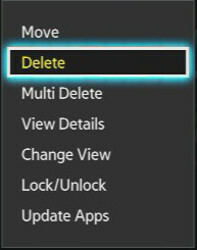 Use the navigation pad to select Delete to delete one app or Multi Delete for multiple apps. 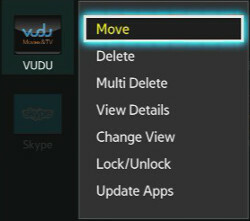 NOTE: Multi Delete allows you to select multiple apps and then deletes all of the selected apps. 6. A pop up appears to confirm the selection to delete the app. Select Yes to continue. 7. 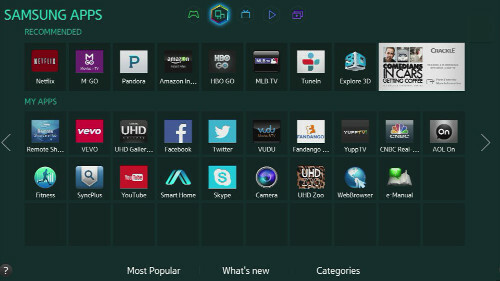 The app is removed from the Samsung Apps panel.